Remedy's Matias Myllyrinne isn't angry, he's just disappointed with game journalists who posted leaked Alan Wake footage. Game journalism is not about playing a game in 10 minute segments and posting random quality videos on the net. Disappointed. It's an interesting comment, given his earlier Tweet of "Annoyed someone leaked 11 minutes of wake.., spoilers out there." Random people giving away his game's secrets is certainly an understandable gripe, but Myllyrinne seems to be just as miffed that videos being posted are of varying quality. That may be because Microsoft is saying that Alan Wake "sets the bar" for cinematic action, and Myllyrinne is afraid that the leaked vids don't do the game justice. Or maybe he's just plain nervous about the game's impending release. Alan Wake has been in development for, it seems, a period of time just slightly shorter than the Bronze Age, with its eventual emergence frequently in doubt. Now that it's finally scheduled to see the light of day (for reals! ), it wouldn't be unreasonable for Myllyrinne and crew to be a bit anxious about its reception. Fear not, Matias. Spoilers and shoddy video quality be damned, Alan Wake was one of my Five Favorites from last year's E3, and I'm still anxious to get my hands on it. 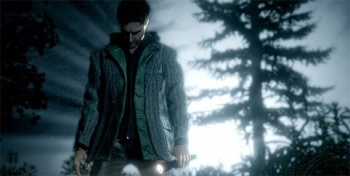 Alan Wake comes out on May 14 in Europe and May 18 in North America.